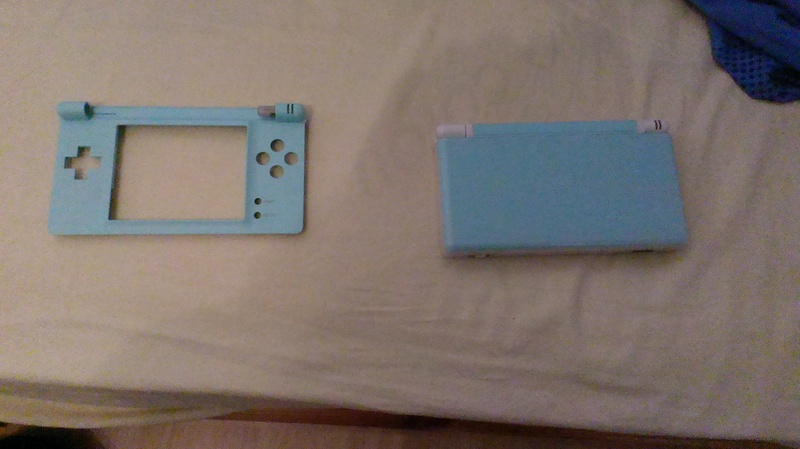 My DS Lite has loose buttons (mostly A and dpad right), and I wanted to fix that. Why not grab broken DS Lite's from eBay and cannibalize them? Might as well mix case parts to make a stylish DS. Meet Black and Blue. Both broken the same way (apparently): when given a good battery and plugged in, charge light turns on for one second, then off, and that's all. Blue is in bad shape. It's covered in some polish thing, but someone tried to remove it off the top using a scratchy sponge, leaving the top rather ugly. It also got some physical damage. The inside is a little dirty, as if it was dropped in a chocolate drink or something, it's weird. Its battery is broken. Black looks better (mostly intact), and its battery is OK. Some research shows that the "charge light on for one second" thing can come from blown fuses. The fuses are here, top one is F1, bottom one is F2. So I quickly try to short the fuses to see what happens. Blue doesn't react to it. It's likely that its power system is failing somewhere. Black, when shorting F2, starts... but the bottom screen flashes white and then it turns off. Which indicates a faulty top screen. Then we get to soldering. Investigation shows that both consoles have F2 blown, but F1 intact. Since I know how to fix Black, I cannibalize Blue and grab its F1 fuse (F1 and F2 are the same). Soldering a 1.5mm long fuse with unadapted tools is a ton of fun. ... nope, sadly. Trying that, I discover that Blue's top screen is damaged, making it mostly unusable. 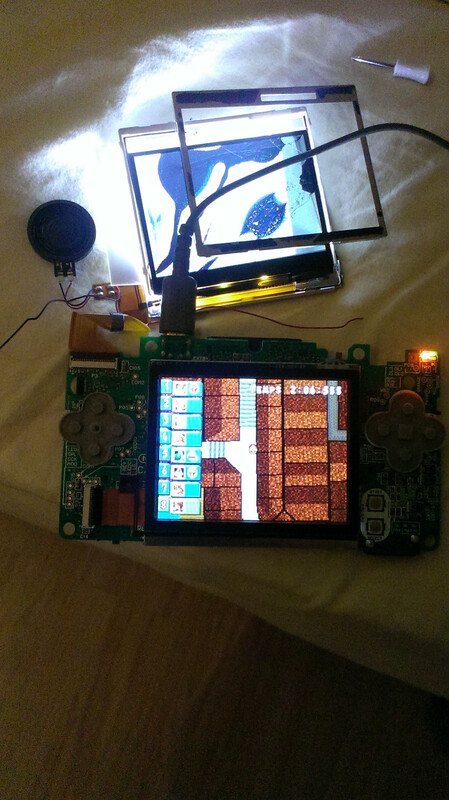 Anyway, Black can run games fine and will make a perfectly good DS once given a good top screen. The game there is MKDS. The wreckage at the top is because I had tried to disassemble Blue's top screen later on (I wanted to see if I could use Blue's bottom screen to replace Black's faulty top screen, but nope: the screens are the same but the ribbons are different and they're part of the screens). The screen wasn't broken by me. I was able to get a replacement top screen from eBay for mostly nothing. 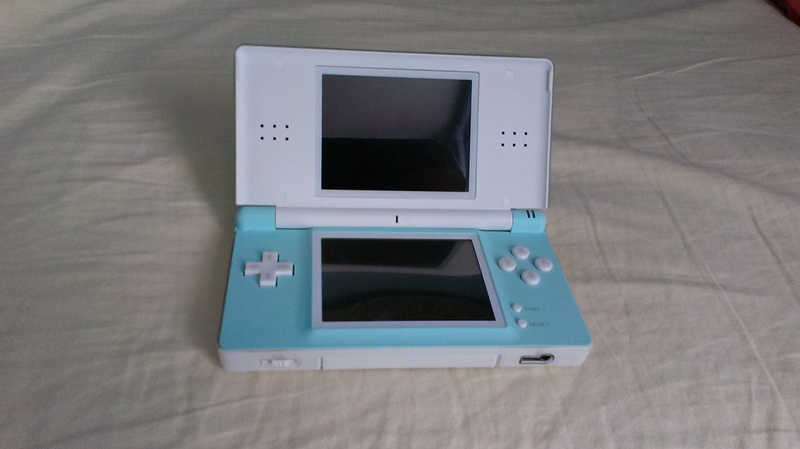 Once I get it, Black will become a perfectly good DS and likely be sold over eBay. 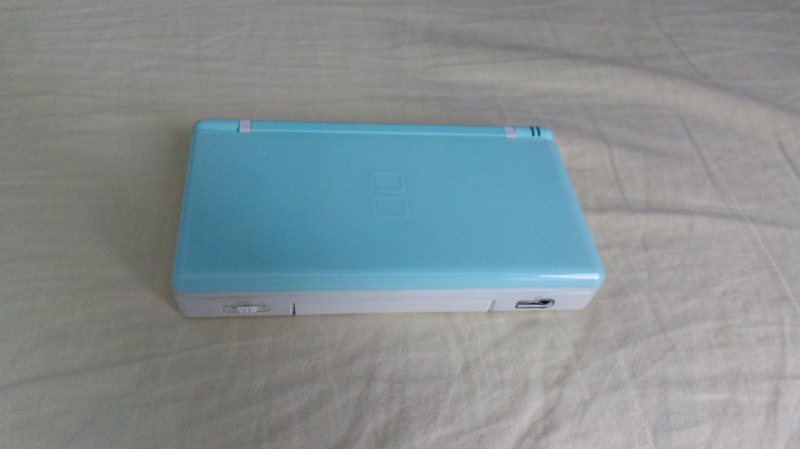 Blue will provide replacement buttons for my DS, and case parts if I can manage to get them nice again. I'm trying to polish the top, with okay-ish results, but it still needs work. Very nice. I am glad for the most part you got a few working machines out of it. Are you going to mix and match cases for that stylized look? The blue is less blue in reality though, my phone tends to make it bluer. Awesome job! Wish I could do stuff like that. I finally found a Sega Game Gear, but alias, the batteries do not keep it charged and I don't have a power cord for it. If I opened it up, I would end up breaking it to bits. MySQL - queries: 150, rows: 555/588, time: 0.040 seconds.